In 1933, the North Carolina Federation of Women’s Clubs made a resolution and the North Carolina General Assembly passed it, making the chickadee the state bird. There was one small problem, though. The chickadee's nickname was the “tomtit” and leaders didn't necessarily like the idea of North Carolina being “the tomtit state.” The resolution was quickly repealed. In 1943, the North Carolina Bird Club started a campaign to choose a new state bird. The campaign was published in newspapers, magazines, schools and local bird and wildlife clubs. Over 23,000 votes were cast and 26 different birds nominated. Nominees included the wild turkey, the blackbird, the tanger and the catbird. The top vote getter though, was the cardinal, receiving over 5,000 votes. The dove was the second top choice. With a very wide sweeping habitat, the cardinal can be found over most of the United States, north into Canada and deep into Central America. The male has bright red plumage year round with a black face mask, while the female can have various shades of brown, gray and red. In 1963, the pine tree was designated as North Carolina's state tree. There are eight species of pine tree found in the state (Eastern White, Loblolly, Longleaf, Pitch, Pond, Shortleaf, Table Mountain and Virginia), but no single variety is the "official" one. Many people consider the Long Leaf Pine the state's official variety, primarily due to the fact that North Carolina's highest civilian honor is called "The Order of the Long Leaf Pine." Because it grows quickly and grows well in sandy or acidic soil (which most of our soil is), the "Pinus palustris" is the most commonly found tree in the state. It's named the longleaf pine because it does indeed have the longest needs in the pine family - needles that can grow up to over 18 inches long! This tree is easy to identify because the needles always grow in bunches of three. The longleaf pine can live several centuries, with a slow growing one living over 300 years. The Southern long leaf pine, a slightly different tree, is the official state tree of Alabama. Two species of fish have been chosen to represent the state of North Carolina, one adopted in 1971, the other in 2005. One is the only freshwater fish native to North Carolina, while the other could actually be illegal to sell. Both of these fish are native to the state of North Carolina, with one being found in the mountain areas, and one more along the coastal waterways. One is a fairly common and popular fish for local anglers, while one actually has fairly strict legislation on the purchase/selling of it (thanks to its federally protected status). In 1971, the North Carolina General Assembly designated the Red Drum Channel Bass as the official state saltwater fish. Found mostly along coastal waters, the bass (also known as Redfish, Spottail Bass or just Red) can weigh up to 75 pounds. In 2007, due to dwindling numbers, President George W. Bush made the fish a federally prohibited species, meaning that one caught in federal waters cannot be sold. Ones caught in state waters, however are legal to sell. So if you're fishing for these with the intent to sell the meat (which many people do), be aware of who owns the water that you're in! Locals know these as channel bass, spottail bass and redfish. At a mature age, these fish can grow up to be 100 pounds and be 5 feet long! The Outer Banks of North Carolina are home to legendary tales of red drum, and it's what most people wading in the waters are looking for. In 2005, the North Carolina General Assembly adopted the Southern Appalachian Brook Trout as the official Freshwater Trout of the state. The trout was chosen because it's the only species of freshwater fish native to North Carolina. Since it does tend to thrive in cooler waters, it's often found in the North Carolina mountains. Locals call these fish “specks,”“speckled trout,” or “brookies.” You'll know these fish by their distinctive color: an olive green upper side with dark green markings on their backs and tails that sort of look like worms. Fishermen like these because they have especially delicate flesh and an excellent flavor, plus they're usually pretty willing to take either artificial or natural bait. For the most part, they don't grow larger than 6 inches, and don't weigh more than a half pound. Think it's a bit unusual that North Carolina has an official state fish (and two at that!)? That's just the beginning. Check out the rest of North Carolina's state symbols, including our official drink, our official dance, the North Carolina state bird, reptile, dog, and more. Here's a look at all of North Carolina's state symbols. In 2003, the North Carolina General Assembly approved the Carolina Lily (Lilium michauxii) as the official state wildflower. The flower can be found throughout the state and grows up to four feet high. Usually with 1 to 3 flowers, up to six blooms is possible. The petals are reddish-orange with brown spots and are curved back so that the tips overlap. The Carolina Lily grows all over the southeastern United States, from Maryland to Florida, and blooms as late as October (though it is most prevalent in July to August). Check out the rest of North Carolina's state symbols. North Carolina's state symbols. In 1987, the North Carolina General Assembly was considering options for an official state boat. Drawing from the state's Outer Banks history, the shad boat was chosen to represent the state. Named for the type of fish it was used to catch, the shad boat was a small craft specifically designed for navigating the waterways around the Outer Banks. Larger crafts weren't maneuverable enough, so a specific design was needed. The shallow hull of the shad in addition to it's easy navigation makes it ideal for the shallow waters and sounds, where weather can change rapidly. Native trees such as cypress, white cedar and juniper were used for construction, the length of the boat was usually about 28 feet. The boats were very expensive to produce though, and the shad boat construction ceased in the 1950s. There actually are only small number shad boats left on Roanoke Island. One is on view at the George Washington Creef Boathouse in Manteo. Another one, originally built in 1904, is on display at the Museum of the Albemarle in Elizabeth City. In 2001, the North Carolina General Assembly declared the Scuppernong grape as the official fruit of the state. The Scuppernong (vitis rotundifolia) is a muscadine grape, and was the first grape to be cultivated on American soil. Named for the Scuppernong River, a blackwater river that flows through Tyrrell County and Washington County into the Albemarle Sound on the North Carolina coast. In 1524, an Italian explorer, Giovanni de Verrazano, made note of the grape variety while he was exploring the Cape Fear Valley. Sir Walter Raleigh also made note of the abundance of grapes in 1584, when he said that the region was "so full of grapes that the very beating and surge of the sea overflowed them. In all the world, the like abundance is not to be found." In 1585, even Governor Ralph Lane was amazed by the grape crop, describing the coast as "the goodliest soil under the cope of heaven, so abounding with sweet trees that bring rich and pleasant, grapes of such greatness, yet wild, as France, Spain, nor Italy hath no greater." 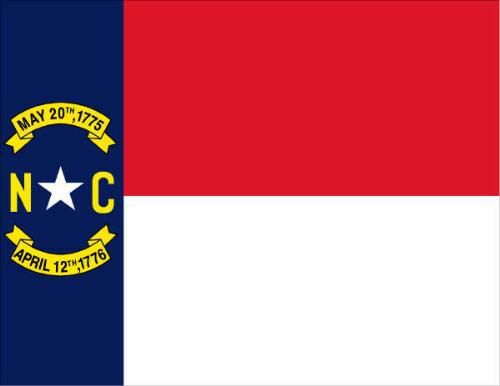 In 1893, the General Assembly of North Carolina chose "Esse Quam Videri" as the state's official motto. The motto, along with the date May 20, 1775, is on the state coat of arms and the state seal. Taken from Cicero's "On Friendship," the phrase can be literally translated "Few are those who wish to be endowed with virtue rather than to seem so." Even further translated, and simply put, North Carolina official has it down as "To be, rather than to seem to be." Until the General Assembly chose this motto, North Carolina did not have one, making it one of the only states (and the only one of the original thirteen) without one. The next time you're outside,take a look at the first butterfly you see. There's a good chance it's North Carolina's state butterfly. The Eastern tiger swallowtail, scientifically known as Papilio glaucus, was designated as North Carolina's state butterfly in June of 2012. The butterfly is native to North America, and one of the most common and most easily recognized species found in the Eastern U.S. It's widely accepted that the Eastern tiger swallowtail was the first North American butterfly species to have been illustrated. John White - an artist and cartographer who was the governor of the Roanoke Island colony (that came to be known as the Lost Colony) - first drew the species in 1587 while on an expedition for Sir Walter Raleigh in Virginia. These butterflies are usually pretty easy to identify thanks to their distinctive colors. The male is usually yellow with four black stripes on each wing. Females are usually yellow or black. You'll find them from spring to the fall, and usually around the edges of woods, in open fields, in gardens or by roadsides. They usually hang out around the tops of trees, but they like to drink from puddles on the ground (sometimes in large huddles or clusters). They like woodlands, flat grassy areas, streams, and gardens, but they will also wander into city parks and yards. When it comes to food, they prefer the nectar of sturdy plants that have bright red or pink flowers. You'll often find then engaging in a common butterfly activity known as puddling, where a group will gather on mud, damp gravel, or rain puddles. They're taking in and absorbing amino acids from these sources, which helps with their reproduction process. If you see a puddling group, it's most likely a group of very young males. The males generally only puddle in their first few days, and females don't gather in groups. North Carolina is in good company with this selection of this as their butterfly, as the states of Alabama, Delaware, Georgia, South Carolina, and Virginia have all also chosen the Eastern tiger swallowtail as their official state butterfly (or as their official state insect). North Carolina does have a separate state insect - the common honey bee. These butterflies aren't harmful, but the female of this species will sometimes give the impression she is to a particularly nasty predator, imitating the warning signs of the highly poisonous Pipevine Swallowtail butterfly. Check out the rest of North Carolina's state symbols, including our official bird, fish, drink, dance, and more.